traces of sulphur and phosphorus; hence the ore is adapted to the manufacture of Bessemer, Martin, or Crucible Steel. Its cost in Cumberland will not exceed $5.00 per ton. Prolonging the course of the vein into Virginia, it follows the Eastern slope of the Blue Ridge, traversing Fauquier, Rappahanock, Madison, Green and Albemarle Counties, where valuable deposits of rich titaniferous magnetites have recently attracted attention. Allowing $3.00 per ton for mining, (which is a liberal estimate) a 50 per cent, ore, free from phosphorus, can be delivered at the furnace bank in Cumberland for $6.20 per ton. Last, but not least, Lake Superior ores can be shipped via Cleveland or Sandusky, and the Pittsburgh and Connellsville, or Baltimore and Ohio Railroads, and delivered at an advance of $2.00 per ton on their cost in Pittsburgh. Mixed with the first mentioned magnetic ores, the percentage of titanium can be reduced in the stock, so as not to interfere with the regular working of the furnaces, and the cost of the ore per ton of iron will then be below Pittsburgh rates. Besides these inexhaustible sources of supply of rich ores, the large and ever increasing shipments of coal from Cumberland to tidewater, and thence to all ports on the Atlantic, offer ready means of cheap return freights for North Carolina magnetites, and the pure African hematites. The toll from Georgetown, by Canal, is 46 cents per gross ton, and the total cost of transportation will not exceed $1.30. African ores, containing 62 per cent, of metallic iron, and worth $10 per ton at tidewater, will therefore cost $11.30 in Cumberland. 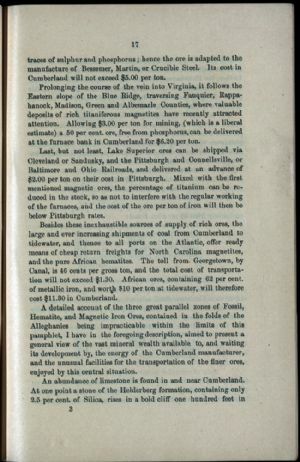 A detailed account of the three great parallel zones of Fossil, Hematite, and Magnetic Iron Ores, contained in the folds of the Alleghanies being impracticable within the limits of this pamphlet, I have in the foregoing description, aimed to present a general view of the vast mineral wealth available to, and waiting its development by, the energy of the Cumberland manufacturer, and the unusual facilities for the transportation of the finer ores, enjoyed by this central situation.